Losing a dog or cat can be a scary experience, for them and for you! Micro-chipping is a safe, affordable way to help bring them home safely. With pet microchips, any animal shelter or veterinary hospital can identify your pet with a simple scan. Your information will become available to them and they will contact you to reunite you with your beloved family member as soon as possible. A microchip is no bigger than a grain of rice, but it can give you enormous peace of mind. The chip is inserted just under the skin using a needle. This can be done at an appointment along with vaccines, or ideally, we can place it while your pet is asleep during a routine surgical procedure such as a spay or neuter. 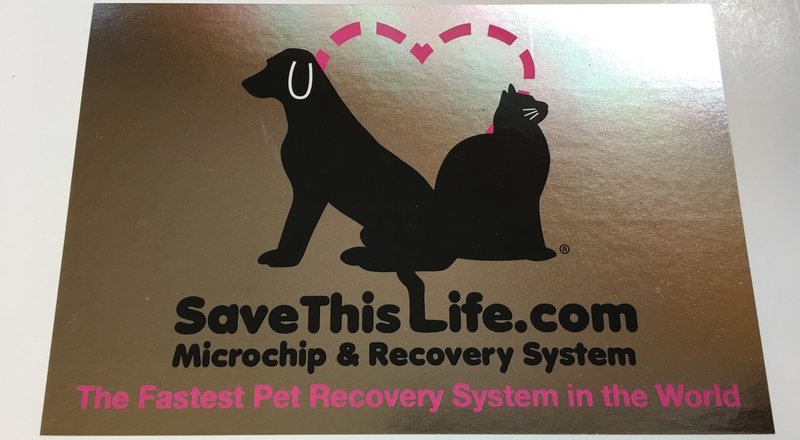 At Fairlea Animal Hospital we use "Save This Life" microchips. Save This Life has patented a way to use a Google™ search to help you find your lost pet! When someone finds a pet and performs a Google™ search of the microchip number, they can then privately contact the pet owner via text and email. The pet owner receives a GPS map of where the person who found their pet is located!